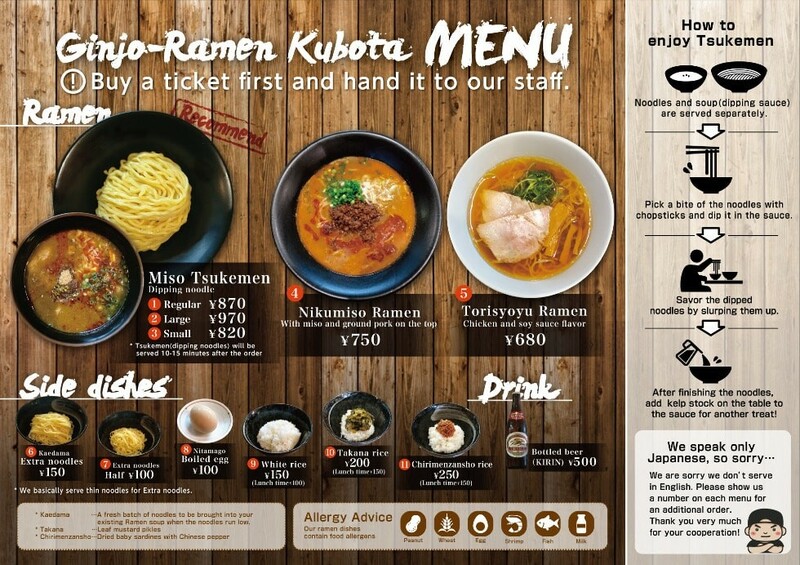 Ginjo-Ramen Kubota is a restaurant just 12 minutes by foot from JR Kyoto Station. Of the Tsukemen,Ramen restaurants, this is a highly popular top-rank store. Ginjo-Ramen Kubota is famous for its Tsukemen with thick seafood broth, using carefully selected Kyoto miso only. Originally, “Tsukemen” is served with noodles and soup (dipping sauce) separately, just like zaru soba noodles. You dip the noodles in the sauce and eat them. The soup is usually thicker than regular ramen. 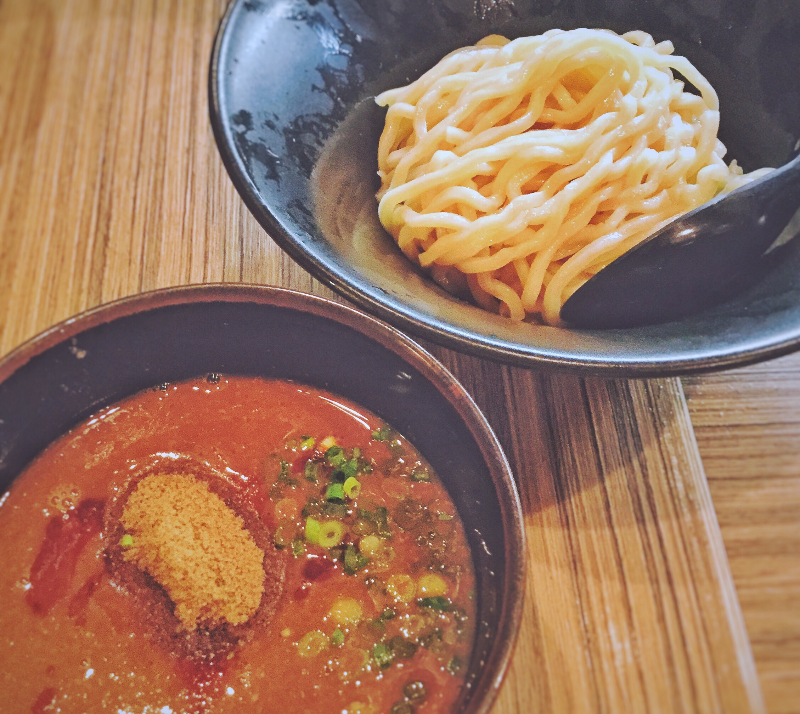 What is so amazing about Ginjo-Ramen Kubota is that all of its dishes, not only its famous Tsukemen, but also their ramen and other entrees are also all extremely delicious. They have carefully perfected their materials and processes, not being satisfied with a taste that had once been perfected, but instead researching and improving every day. The bowl that results is no longer within the realm of ramen, but has reached the level of art. If you eat one bite, you will be impressed by the depth of the taste, and with the second bite, your whole body will rejoice in the extreme deliciousness. If you take a third bite, you will definitely become an enthusiastic fan. This may be exaggerated, but Ginjo-Ramen Kubota gives you that kind of feeling. The restaurant features a quaint Japanese style, like a renovated Japanese Machiya townhouse. It is always crowded with families and female customers, as well as foreign tourists. The thick dipping sauce features carefully selected Kyoto miso as a basis, to match the thick curly noodles. The key is that the fish meal and pepper floating on top of the soup should not be mixed in, and should be eaten as it is. The dipping sauce features the flavor and sweetness of miso to the maximum, and if you eat a bite, your image of miso will be completely changed, in a good way. The correct way of eating Dipping noodle (Miso) is to add the thin soup provided in thermos bottles on the table at the end after you finish eating the noodles, and to eat it as a soup. Ramen made based on light soy sauce. The gentle flavored soup with clear broth gives the feeling of something exceptional. And your hunch will not be disappointed. Even though the soup is thin with gentle flavor, it has a solid broth, making it feel almost like elegant Japanese kaiseki cuisine. For those who like subtle flavored noodles, we recommend this. This thick ramen is made with the same carefully selected Kyoto miso-base as the Dipping noodle (Miso). It looks spicy, almost like Tantan noodles, but there is almost no hotness of chili peppers. Rather, the taste of the soup is sweet, with a gentle blend of miso and pork with secret spices, and it has a deep flavor. The soup features a generous serving of ground pork fried in sweet bean sauce, and by eating together with the thin noodles, the taste and texture of the meat can be felt directly. The limited Mazesoba is only served on Fridays. Mazesoba is a kind of ramen, usually without soup, and you eat it mixed with sauce and sides. It is also referred to as tossed noodles, oil noodles, and no-soup noodles. First stir the ingredients and the noodles together vigorously, and then enjoy. The Mazesoba at Ginjo-Ramen Kubota has unique toppings rarely used in other ramen restaurants in Japan, such as crispy fried bread, nuts, and minced meat. It is hard to imagine the taste from the appearance, but if you eat a bite, you will scream in surprise from the overlap of the flavors with each other, leading to a rich and deep taste. This Mazesoba is based on the owner's prior expertise from working in a Chinese restaurant, and based on the basic knowledge of Chinese cuisine, it was devised through constantly evolution and improvement. Try it out by all means. First, buy a meal ticket at the meal ticket machine in the shop. Put in money, select your favorite Ramen, and press the button. 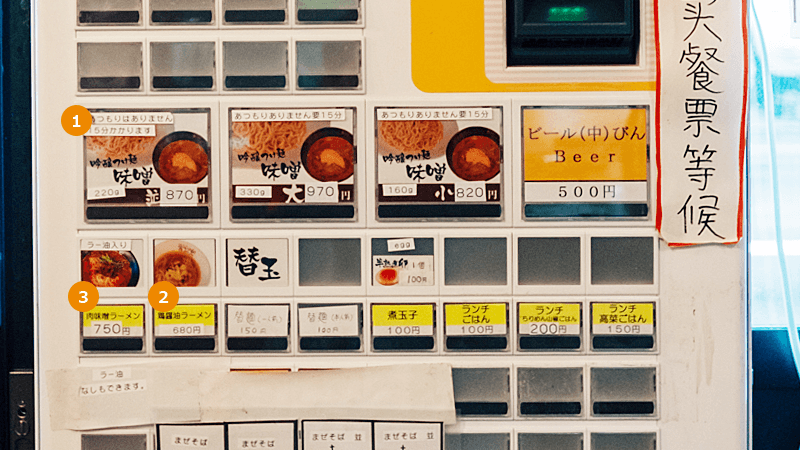 Since the English version of the menu is placed on top of the meal ticket machine, if you have difficulty understanding, just look at the menu while you choose a button, and you will be able to order easily. Be careful to buy a meal ticket at the time you enter into the shop. When there is a line waiting to be served, do not cut in to buy your meal ticket. If you want to adjust the amount of noodles, you can get Oomori for plus 100 at the ticket vending machine. Press the button that says 大 to buy your meal ticket. Since the large serving is quite large, an average guy should be fine with normal size, and women will also be happy with the normal size. I have eaten 100 or more bowls of ramen in Kyoto, but my all-time best is here, Ginjo-Ramen Kubota. Even though they use miso, which is still not a mainstream ingredient here in Kyoto, they have achieved an overwhelming quality, with which pork and chicken based ramen from other nearby shops cannot compete at all. 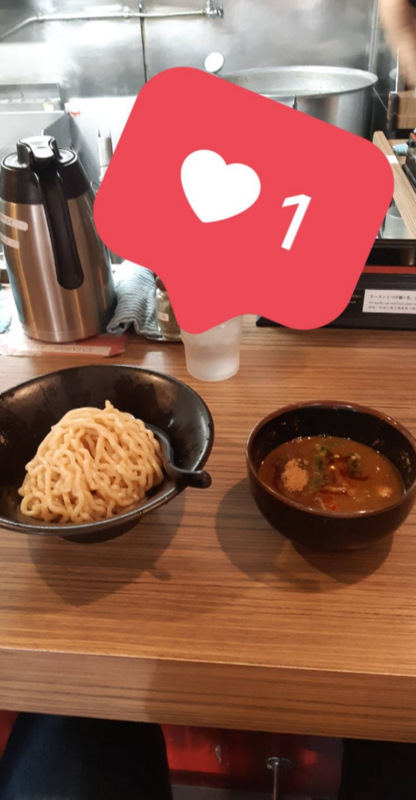 It is clear not only from the food but also from the hospitality and the shop sign that they sincerely love ramen, and want you to eat delicious ramen in the best possible conditions. Whenever I come to eat here, I always get a warm feeling. Since it is a really great shop, I recommend it with confidence. By all means, please try it out! The ultra-popular restaurant near Kyoto Station, Ginjo-Ramen Kubota. Their classic Ginjo miso dipping noodle is the most delicious miso-flavor dipping noodle that I have tasted in all of Japan! The greatness of this store is also that all the limited editions sold on certain days of the week are all very delicious. I recommend you try the Ginjo miso dipping noodles on your first visit, then return regularly to eat the limited day only dishes. The restaurant may be crowded at lunch time, and you may wait 20-30 minutes to be served.